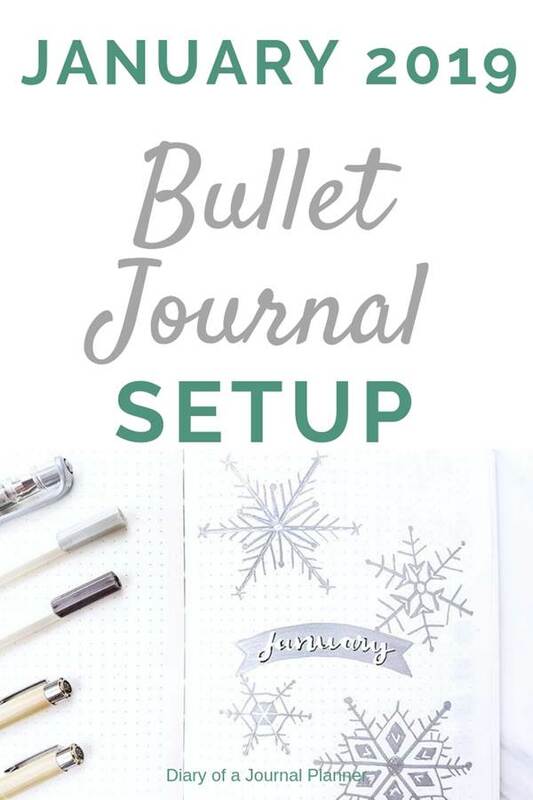 Join me as I setup my January Bullet Journal Layout! A lot of things happen in December regarding my planning. First, there is the ever-running weight loss challenge that I take up with the arrival of the new year (planning to change it this year!). I also feel inspired with the beginning of a new year to work hard on business strategies and rethink my systems, reflect on the past year and make goals to be accomplished in the new year! 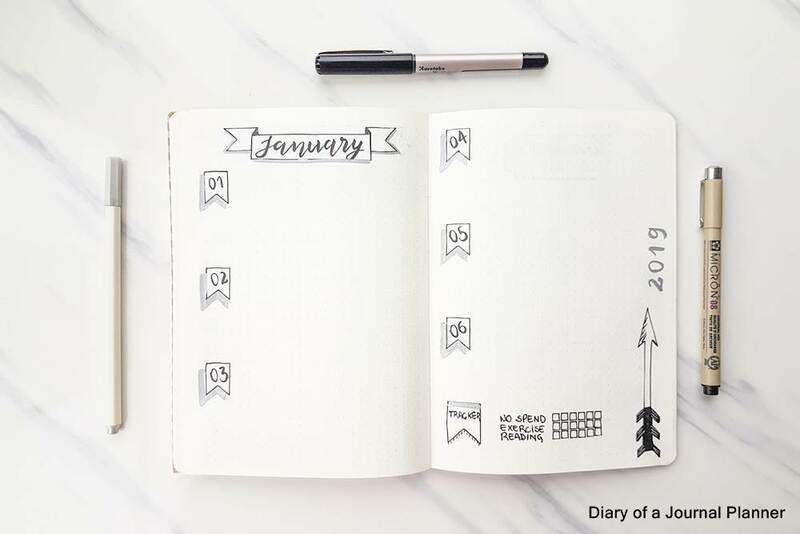 January also coincide with the beginning of my 12 weeks plan schedule so I also have a lot to think regarding ways to be more effective and profitable with my work, meaning that there is a lot going on in my planner for this month. 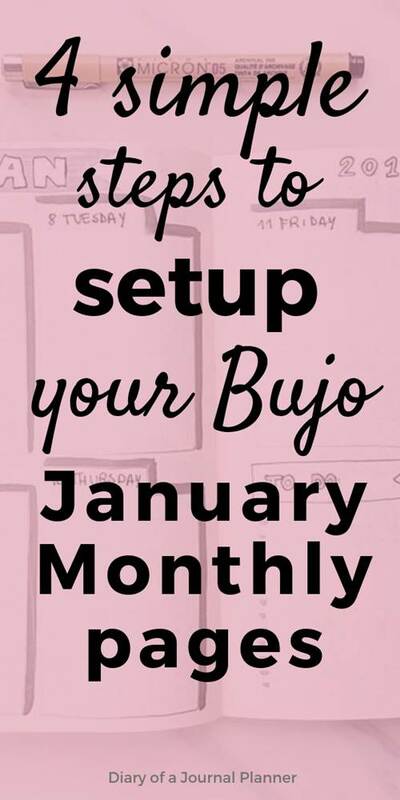 Since the new year calls for a shift in mindset where I am more concerned with prioritizing and time management, it happens that January is never my favorite styled month. 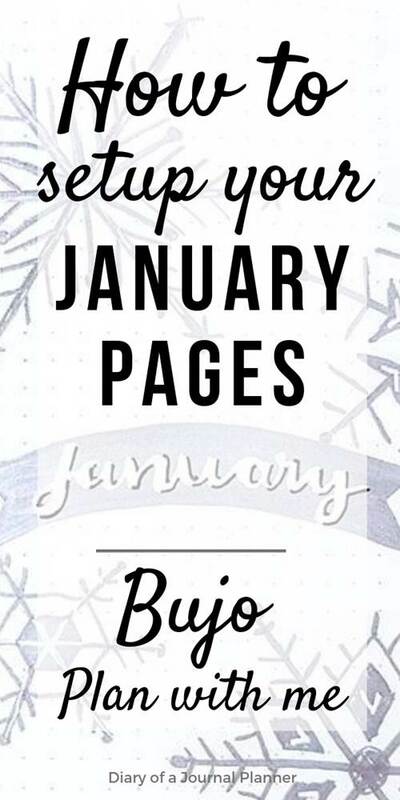 I set my January spreads in December so there is little time to worry about the looks – it just has to be ready for me and my big plans! This is okay though. I actually love the minimalist style too, I just tend to add colors and a few elements because I am sassy and I can’t change it! 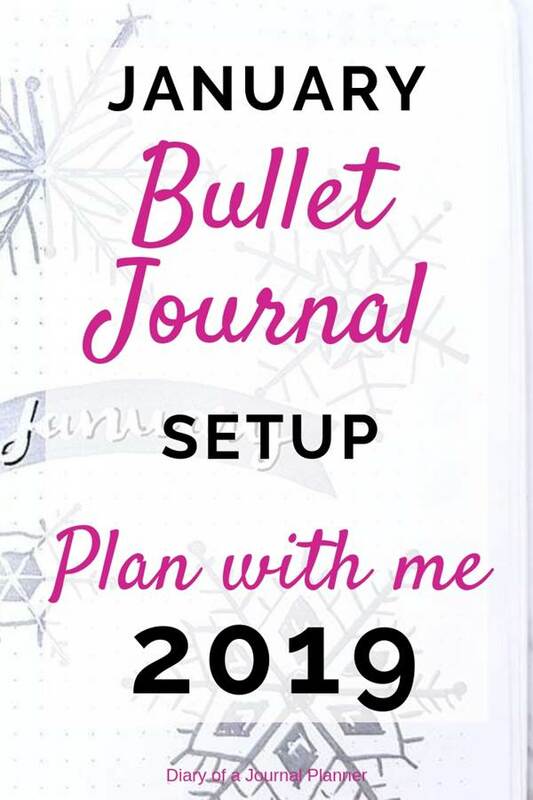 So follow me as I show you some of the pages for my January bullet journal 2019 layout! Here are some of the bujo pages I have created so far for the month of January. As always, I start with my monthly cover page. I used some of my golden metallic pens in previous layouts and I thought it was time to use the silver. 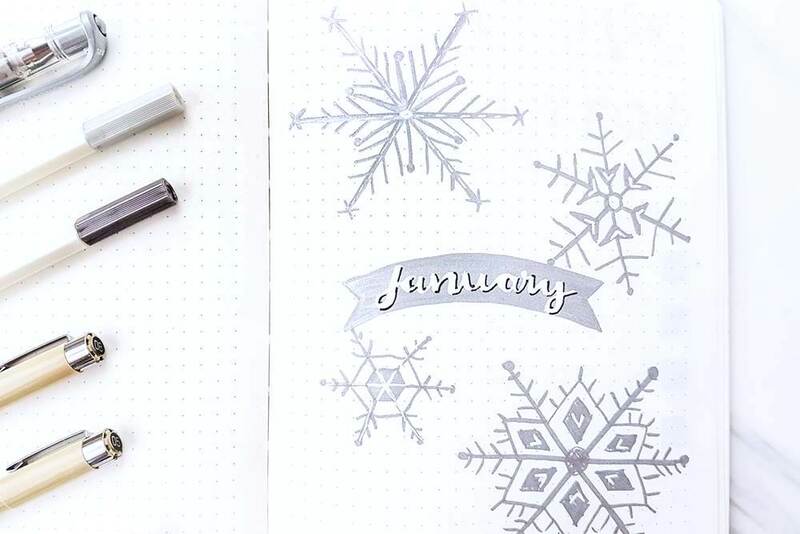 January theme is winter and snowflakes. I wrote about my snowflake doodles some time ago and in my cover page this month I used a few of the designs. You can learn how to draw these snowflakes in my post here. 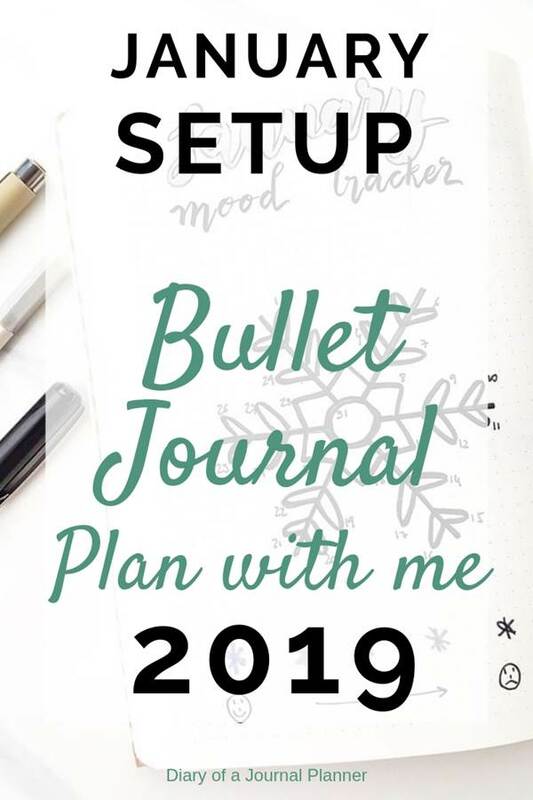 And if you are looking for more January bullet journal themes, them my bujo monthly theme post will help you with hundreds of theme ideas. For this page I used my handmade stencils to make the banner with my silver brush pen. I then wrote ‘January ‘with my white Uni-ball broad gel pen and can you see how it covers everything? No wonder this is one of my favorite bullet journal pens! This pen is a must have! Then I added details using my Sakura Pigma Micron. 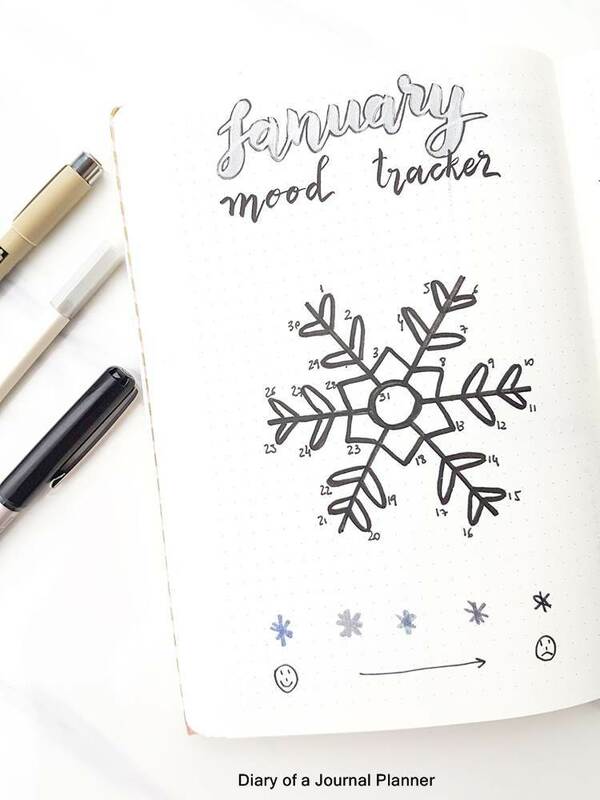 The January bullet journal doodles followed my snowflake drawings, check out the step by step instructions. Finally I used my stencil again to add a banner for the year at the bottom of the page. This is how it turned out! a simple and easy cover setup! 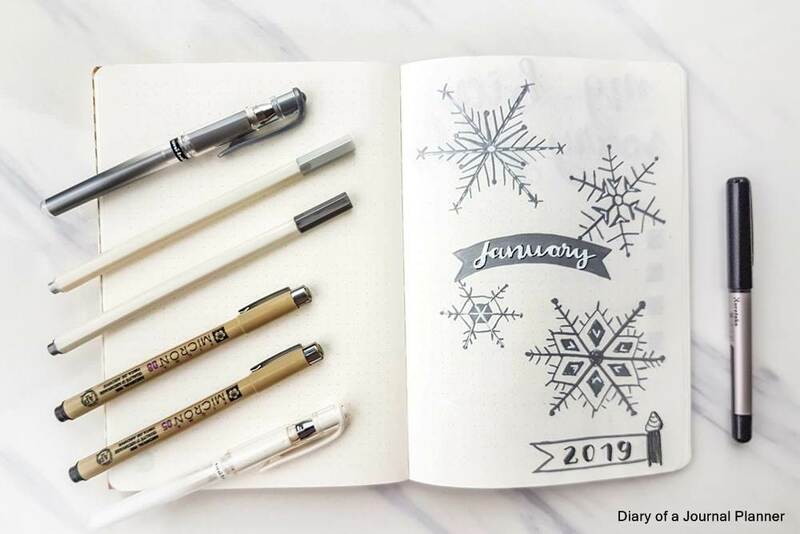 I haven’t started January with a new bullet journal notebook because my notebook has plenty of pages left for this month so I skipped the future log, the key and the year at a glance pages but if you are starting out with a new journal I definitely recommend you to add those pages. 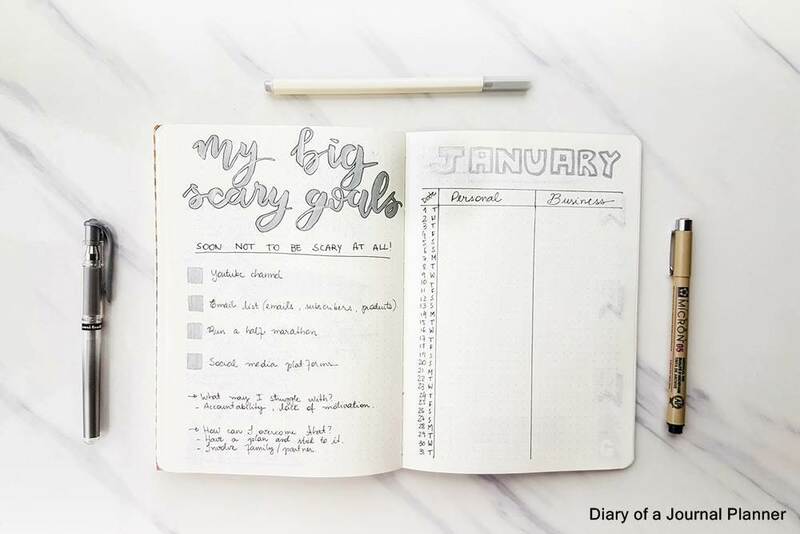 I like to add a monthly list of tasks and goals to all my monthly pages and because it is January I have a list of very scary goals. I made this page to remind me of my goals which are in line with my vision board. I address some of the overall goals and a few tips to help me get through struggle times. 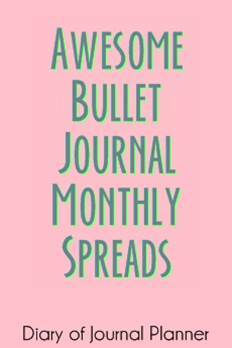 Then I went ahead and added my bullet journal monthly spread for January in the next page. I normally need more space for my bujo monthly layouts but I know January is slow with the holidays and getting back into routine after December. 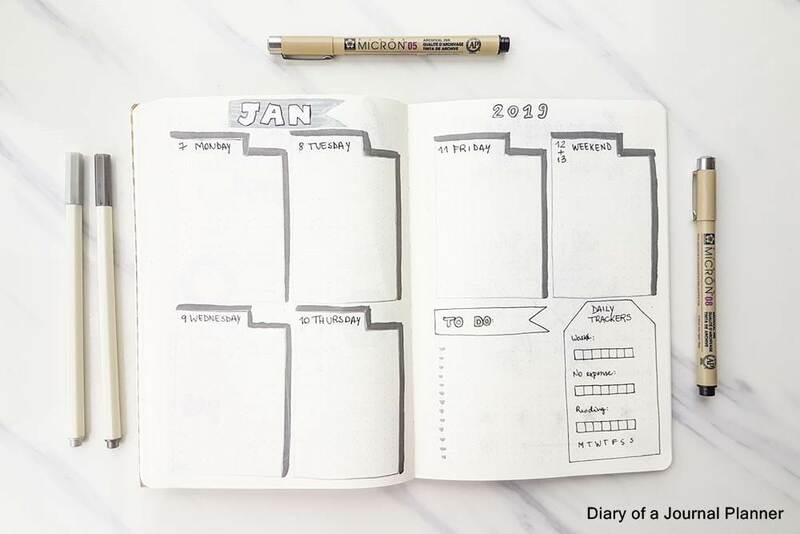 So I decided to make a simple January bullet journal calendar spread, in the same way suggested by the bullet journal method. I created a column with the date and added 2 extra columns to separate personal tasks and appointments from the business related ones. I created 2 weeklies for January so far. Sometimes I go ahead and create the entire month’s weeklies but I am trying a few different layouts as I am using my DIY stencil and want to see if that works for me first. The first weekly layout is my traditional go-to spread style with the consecutive days. I finish my week with Sunday and this first week of the year is a short one with only 6 days. Since I had a little bit of space in the bottom I decided to add an extra weekly tracker there just to keep track of a few things I would like to do daily. 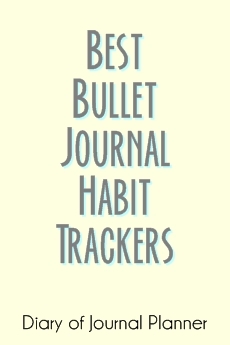 I made the simple habit tracker spread to keep tabs of these activities. For the second weekly I used the stencils I made again with the square tabs for the daily tasks. I really like this layout and I had extra space to add a to-do list and small tracker too. I will see how I like it when I use this layout and let you know but I think I will enjoy it!! 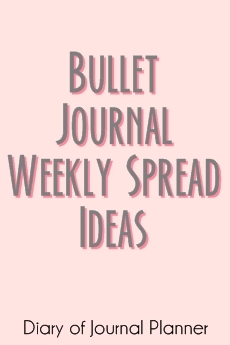 The banners are also part of my stencil template but here is a handy post on how to make beautiful bullet journal banners and header. This is a little variation of my normal gratitude log, where I write a sentence or two about something I am grateful for the day. This time I am going to try and keep it concise at one word a day. It could be not necessarily a word related gratitude, I want to see the kind of sentiment the word has. Is it a positive or negative word? Is it a word of caution? How does that word related to the day before? It is the first time I try this spread and I think it will be fun to see how it turns out! I was feeling creative and made this spread just for fun and visualization. There are a few health and lifestyle goals that I have outlined in my vision board that I want to constantly be reminded of and that is why I made this collection. 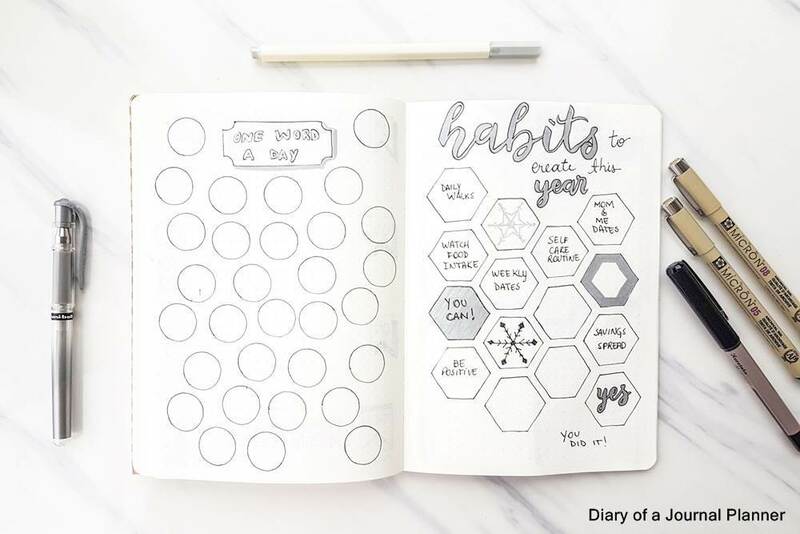 I used my DIY stencil template to make the hexagons and I filled them with words of motivation, doodles and some tasks to help me achieve the goals. I left some hexagons empty just in case something comes up in my mind during the month and I need a little space to add them. I didn’t add the year in pixel template this time because I am finishing this notebook but if you are starting a new journal I certainly recommend you do. Following the snowflake theme I made a large snowflake doodle which I will color each day with my mood of the day. I used the same drawing ideas to make this large doodle, only difference I made space to fill up each day and added the dates.